The 12/12/12 Concert For Sandy Victims, Robin Hood Relief Effort, Madison Square Garden, New York City, Racist? 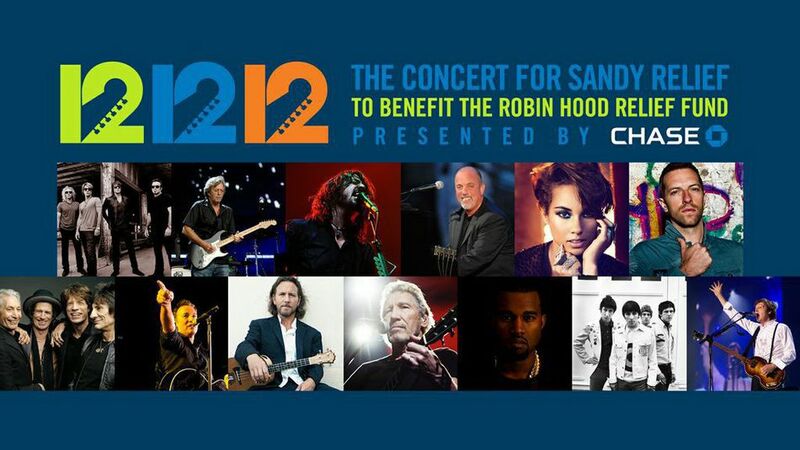 The 121212 Concert for Sandy victims, Robin Hood relief effort, Madison Square Garden in New York City was awesome. Viewed it on Bloomberg HD Channel. It was brilliant. Ticket prices range from $150 to $25,000; the top end sold out immediately. But I went to sleep late since the concert ran over 1am east coast time. McCartney closed it down. But first review I read this AM is that it was Racist. WHAT? GMAB. It did not reflect the diversity of New York City and of the people affected by the storm. Really? There is a whole lotta white people on Staten Island still without power. This Hurricane was not racist. The concert had breaks of video and showed the pubic housing affected, fly overs of the entire Jersey coast line while it gave time for the musicians to set up their instruments. Do you think they played each others band pieces? How the stage people prepared before every band was brilliant. McCartney had a new set of strings/guitar every song. Then he went to keyboards. Back down to stage level. Wow. Endless energy was present from all who participated. The finale had the first responders all up on stage also. Excellent. They will be the people who will aid the in rebuilding in the years to come. Getting back to the racist issue. Why because there was a group of white men? But Ms. Keys did perform. I know she sung that New York song, they debut it during the Empire State Building light show, LED effects. Did not see the K. West fiasco either. It was a rock concert. London was invited. Not R&B, pop or rap. I missed the middle of the concert. Will view it at a later date, the file is 8 GB, downloading it as I type. But, there is racism in a benefit concert? I attended Live Aid in Philly at the demolished JFK, that held over a 100,000 outdoors. Amnesty International. But this was special. This hit home. It was at the Garden. I never was at the Garden. I lived at the Spectrum from 1972 forward. Bruce and Jon are Jersey boys. I worked from Keyport down to Atlantic City. Vacationed in Long Beach Island, Beach Haven Crest to Ocean City. It is in ruins. I saw Bruce singing with Bon Jovi. Jon was holding himself back at times during Born to Run. Then Bruce interjected the lyrics of into Jon’s tune. Priceless moments. Nirvana playing instrumentals with McCartney.. My son corrected me, the musicians from The Foo Fighters. Kurt Cobane has passed. Can’t wait to view Roger Waters with Eddie Vedder. Eddie Vedder does that cover Comfortably Numb. He got a chance to perform it with its originator. That is what made the night so special. Bruce played at the Stone Pony in Asbury Park, New Jersey. Yeap, right on the boardwalk. I worked on that boardwalk in the winter of 94′. It is a Jersey thing. It is in ruins totally destroyed by Hurricane Sandy. Rock is so Alive. Rock isn’t racist either. PS. I wonder how the dressing rooms were prepared, what rocker was next to whom? These men have 5 decades of Star Power. Maybe they will do a video of the interactions behind stage. It was viewed in approximately 22 countries. Broadcast to nearly 2 billion people around the world. It was awesome. Lighting, set design. So totally awesome. This concert will never happen again. It will take many years to rebuild the Jersey Shore and New York’s coast to the Atlantic Ocean. Donate to the Robin Hood Relief Fund. Click Here for International Donations. Great Video Below Minus Hussein in the photo-op right before his reelection. He did not allocate extra money to New Jersey relief. Christie was foolish in thinking other wise. Hussein just used him. Bruce Springsteen and Paul McCartney amps were cut by Hyde Park’s curfew Police last night to a crowd estimated at 65,0000. Local London council at 11 pm were sticking to their licence for the event. The Boss didn’t have any control over the rendition of “Twist and Shout.” People who traveled miles and withstood the rain were quite upset. Rage Against the Machine, The E-Street Band and guitarist Tom Morello were back ups. Springsteen is known for his marathon concerts over 3 hours in the US. Evidently, bloody England is quite different. Bruce could have used an NFL time management head coach. Calling Andy Reid anyone? Gary Macdonald @gmacca69 tweeted Olympic city capital city big joke what an embarrassment when the world was watchin 2 legends disrespected disgraceful. astonadam ‏@astonadam tweeted you lot are mental. We are perfectly capable of getting home without your interference. Stop spoiling the little fun left. Stephen Merchant ‏@StephenMerchant tweeted Ashamed to be British right now. Springsteen and McCartney playing Twist & Shout in Hyde Park and council pulled the plug cos of curfew. WTF, who is an actor and comedian. The Conservative-run council have received many complaints from local residence which are popular with bankers, foreign investors and politicians. Noise and crowd control in Hyde Park, from 85,000 people to 65,000 and cutting the volume to 11pm have helped reduce the parks management noise pollution concerns. Bruce Springsteen performed a beautiful acoustic “Thunder Road.” “Badlands,” “Because the Night,” “Waitin’ on a Sunny Day,” “The River,” “Born in the USA,” “Born to Run,” “Glory Days” and “Dancing in the Dark” before bringing on the former Beatle, Paul McCartney for the finale.